As we celebrate my brand new blog, I would also like to launch and invite you take part in Kid’s Get Crafty – a link up party/ blog hop for all craftiness with and for children! Do take part. Do be inspired! Link up at bottom of post! Hooray! Old posts welcomed. Grab a button an add it to your post or side bar. Please do NOT post things for sale or Giveaways! Come back weekly (Wednesdays) and link up! 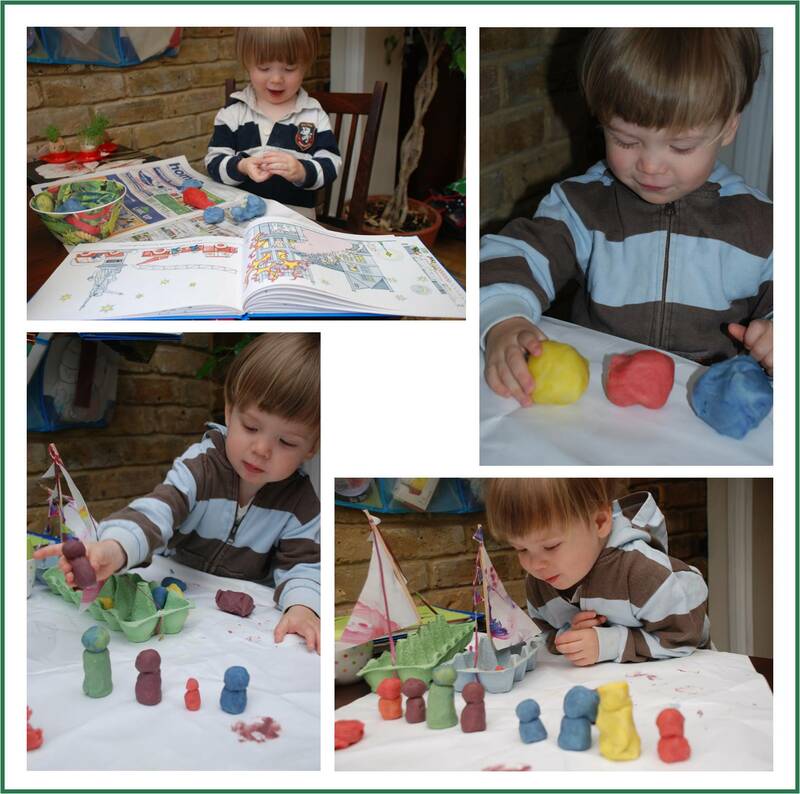 Let’s delve straight in, this week’s story + art project involves previous craftiness – our egg carton boats and scented playdough! Barbapapa, by Annette Tison and Talus Taylor. Reading age 5-7yrs, Read together age: 2yrs – 5yrs. I vaguely remember reading or being read the Barbapapa stories for the first time on a trip to Canada. We were taken to the local library or storytime and I was introduced to the wonderful world of the fabulous Barbapapa family. So before Red Ted was even born, these books (amomgst a number of others) already graced out bookshelves. To my pleasure Red Ted took to the books himself (even tore one up, but we were able to tape it all back up again). Barbapapa is a funny being that can change his shape to anything he likes. In the very first book, Barbapapa is born (like a flower). He is too big to stay with the family he was born into and is sent to the Zoo. The Zoo keeper doesn’t like him, as he is able get out the cages by changing his shape and goes off to play with the animals. 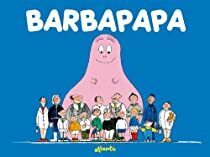 Barbapapa is sad and wanders off… his shape changing abilities then save the day on more than one occassion and the people around him begin to love in. Happy End. (See my Guest Post on egg carton boat for details on how we made our boats!) We made our craft project very simple – we made some playdough (click here to see How Make Scented Playdough) and then had some playdough fun! (For a truly awesome Barbapapa project visit Zoe and here girl’s at Playing By the Book here). Loved this “craft” session, as it gave us a chance to play with other crafty things we had previously made too – like our Egg Carton Boats.So. We played with this over several days. We had fun making little men. We mixed colours. And we got out our sailboats and went sailing (here is the original sailboat post). We lined them up. We made big ones and little ones. We had fun. And our playdough has lasted weeks and we keep coming back to it!!!! Hurray! For more Kid’s Craft, click here. That just bought so many memories! Here in Israel it was called barba-abba (abba is hebrew for dad so I guess that’s why) I watched it when I used to come visit my granparents. Never remember seeing it in usa. Thanks for inviting me to come over and play! Just wanted to let you know that I’m going to be hosting a “Mommy & Me Mondays” link up over at my place http://www.happybrownhouse.blogspot.com You’re invited to join in! Oh no! How frustrating! A wheat allergy! Never thought that that means he cannot make things like playdough, or homemade paper mache glue 🙁 well.. store bought it is. It is fine really, no! Good luck with the horse! LInk it up next week? Thank you for letting me know about your link party. Once the crummy weather begins we’ll need lots of projects to keep my four year old and myself busy. Bring on the inspiration! How fun! Thanks for linking up! Thanks for inviting me to the party, I made it at last! Ah that is a shame, as they are lovely books. I thought that they originated from the US? mmmh maybe not! I regularly see lovely books from the US, that I cant’t easily get here.. very frustrating! Have just remembered… they are originally in French… so yes, probably “European”… shame! Looks like he had fun! Thanks for inviting me to link-up. Can’t wait to check out all the other links! Me again…I’ve linked up and grabbed your button! I’ll be back to link up some more…thanks so much for popping by and for all the comments…makes me SMILE! Fabulous and the more the merrier! Hooray! I have never seen this book before. It looks and sounds wonderful. I also love the sailboats and little men. So much fun! Oh fabulous! Thank you so much for joining in!! Fabulous to have you on board! Do come back again next week! Thank you, Red Ted did enjoy it!! Thank you for the invite. I have linked up, and am a follower now. Fabulous! Just sorted out following you too! so I’ll be sure to catch it each week, and to share with others too! I remember reading Zoe’s post and we still haven’t read Barbapapa yet. I love your play dough activity and the little men you made. Cute, I know the kids had fun with this! What a great boat! We made a boat last week, but it was a failure. We’ll have to give this a try! What an intriguing book – I’m a little sad to read in the comments that they’re hard to find in the US! Thanks for linking up at Feed Me Books Friday! What a great project…he did a great job making his people!! I’m going to try this. I have tons of egg cartons saved up! Love the boats! But then again, I always love your stuff.